The Vision Fitness S70 Commercial Suspension Elliptical Trainer is On Sale! The Vision Fitness S70 elliptical trainer is their top of the line model, and it is available for both residential and commercial use. It is an upgrade from their award winning Vision Fitness S7100 elliptical, which is also warranted for residential use, but only light commercial use. 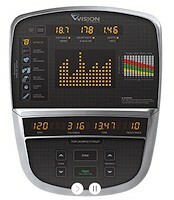 So where the S7100HRT is engineered for abuse, the Vision Fitness S70 is designed for serious abuse. If you are considering an elliptical for the home we are not sure that the S70 justifies the extra expense over the S7100HRT. However, if you are purchasing for a commercial environment and the machine will get more than 3 hours of usage a day, the Vision Fitness S70 is a very smart choice. In fact, it is one of the best choices. WEEKEND SALE ENDS MONDAY: The Vision S70 is ON SALE for $4,399 and they are throwing in FREE Shipping. Suspension Design – With their new generation of elliptical trainers Vision Fitness has switch from a traditional front drive machine to an innovative suspension design. The pedals are suspended and do not run on rails. This results in less wear and tear, fewer parts to maintain and reduced noise. Our team member Fred Waters owns a front drive elliptical and he constantly has to lubricate the rails. He has noticed that the rails are starting to rust and pit even with regular maintenance. Perfect Stride – Perfect Stride is the patented term for the ergonomic and biomechanical design of the Vision Fitness suspension elliptical motion. It is designed to simulate running in the air, and to offer a cardio workout that minimizes stress and strain to your joints. Through the natural elliptical motion, the pivoting foot pedals, and the upright positioning the Vision Fitness S70 mimics the body’s natural movement patterns. The motion is further enhanced by the heavy flywheel. Having workout on the S70 I can say the natural gait is one of the best in the industry. Incline Feature with Variable Stride – The ability to incline the elliptical motion is found on most elliptical trainers. The benefits are the ability to target additional lower body muscles and increase the intensity of your workout. In addition, as you increase the incline the stride length also increases going from 20”-23”, giving you a long, smooth stride. Unlike other ellipticals with an incline feature, the S70 does a good job of maintaining a stress free motion as you increase the incline. Self Powered – The Vision Fitness S70 is self powered, meaning as you start the motion the power kicks in. This is primarily beneficial for commercial setting where easy access to outlets is an issue. Multi-Position Handgrips – The handgrips are elongated and there are dual grips. This allows you to change up the position and target different upper body muscles. Ergonomic Pedals – There are four ergonomic features of the pedals. . They are oversized to allow the user to optimize the positioning of their feet. They are cushioned to further reduce impact. The pedals are only 8.5” off the ground and there are no obstructions, making it easy to mount and dismount off the machine. Sprint 8 – Sprint 8 is a high intensity workout program designed to maximize your workout in minimum time. It is exclusively available on Vision Fitness treadmills and elliptical trainers. One of the biggest constraints to getting in shape or maintaining your fitness is time. The Sprint 8 program was designed by a professional fitness trainer to burn significant body-fat with 20 minute routines. Sprint 8 is basically interval training on steroid. Interval training is proven to be very successful in burning calories and getting people in shape, and in fact it is utilized by professional athletes. 22 Installed Workout Programs – In addition to the Sprint 8 program there is a generous selection of popular workout, which include to 5 custom workouts and 4 heart rate control exercises. The heart rate control programs allow you to define the intensity based on your heart rate. This is another popular method of exercising used by professionals. Very Heavy Unit Weight – As you would expect with a commercial elliptical the Vision Fitness S70 weighs a ton, well not quite – 352 lbs. Obviously it is rock solid and is warranted for users up to 400 lbs. Generous Warranty – We have always felt that the length of a warranty reflected on the machine’s durability and the quality of the components. 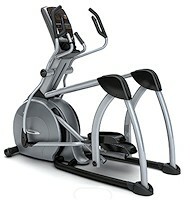 The Vision Fitness S70 elliptical has an industry leading warranty for both residential and commercial use. Residential – Lifetime frame and generator, 7 years parts and 2 years labor. Commercial – Lifetime frame, 5 years generator and parts and 2 years labor. The Vision Fitness S70 is a heavy duty, commercial grade elliptical trainer designed for the most rigorous environment. This machine rates with the best commercial ellipticals for both durability and a rewarding workout. In addition, the customer service is second to none. The company takes pride in satisfying their customers. Many fitness equipment companies fall short in this category. However, if you are considering buying a commercial grade elliptical for the home we would suggest you consider the Vision Fitness S7100. It is not as heavy duty as the S70, but still very heavy duty and it cost $1,800 less.